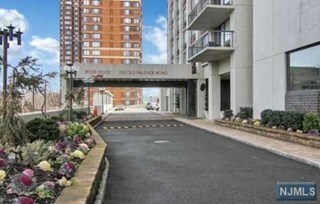 Located at the very top of the New Jersey Palisades only 2 blocks from the entrance to the George Washington Bridge and walking distance from the heart of Fort Lee shopping and restaurants, River Ridge Condominiums enjoy one of the area’s most convenient location, and certainly one with the most un-paralleled views of New York City and the Hudson River. 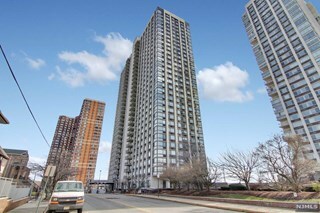 All units regardless of the floor on the south side of the building have unparralled views of the Hudson River and the New York City skyline. In fact it maigh just be the best view corridors of any complex along the Fort Lee Palisades, as it is the only building that faces north and south as oppossed to east and west. Built in 1984, this 31 story condominium with its 243 residences consisting of large 1, 2, 3 bedroom residences as well as 2 & 3 bedroom duplex townhomes on the ground level as well penthouses is one of the premiere complexes of the entire area. One enters into a new very formal and elegant marble lobby with gorgeous wood finishes. A doorman and a full time concierge greet you. There is a classical seating area around a fireplace thus giving a special warmth to the environment. One can access the garage and other amenities directly from the building. The elevators are about to undergo the same transformation as did the lobby. Upstairs, one can choose from an array of stylish and large residences, many with terraces or solariums. The downtown shoppng of Fort Lee is just seconds away that include so many reastaurants, shops and services. River Ridge residences start at 1 bedroom/1 ½ baths with 1,108 to 1,182 square feet of living space and unsurpassed views. The 2 bedroom homes are all over 1,550 square feet. The 3 bedroom/2 ½ bath corner units are really spacious at 1,950 square feet including solariums. Duplex 2 and 3 bedroom homes are over 2,300 square feet. 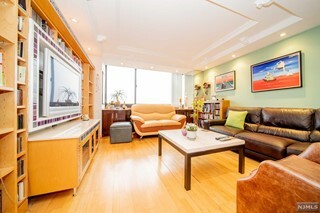 Many units within the complex have been renovated over time and finishes and styles vary with the degree of renovation. As with the corne 3 bedroom homes, tose with 2 bedrooms have solariuns with floor to ceiling windows that give homeowners spectacular views for miles. Washers and dryers are common to each side of every floor. They are just steps outside the residences and there is never a wait. 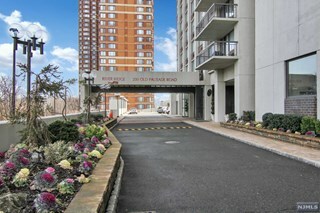 The complex is just seconds from the entrance to the George Washington Bridge and the entrance to 1-80 and Rt.4 and mall shopping in Hackensack and Paramus. The 158 and 159 New Jersey Transit buses are a very short walk away. Restaurants, shops, schools and houses of worship are in walking distance. This is a luxury, full-service building with a 24-Hour Concierge, 24-Hour Doorman, Valet, Health Club, Outdoor Pool, Storage Bins, a Library, On Site Management, amenity Lounge Area, and a Community Room. The pool and barbeque area overlook The Hudson and NYC. The views from the townhomes at the ground level are sensational.